Particularly popular in schools, colleges and universities, print quotas are used to control and restrict users to sensible use by allocating a quota/allowance/budget. Quotas may be easily allocated on a daily, weekly or monthly basis, or on custom dates like the start of a term or semester. 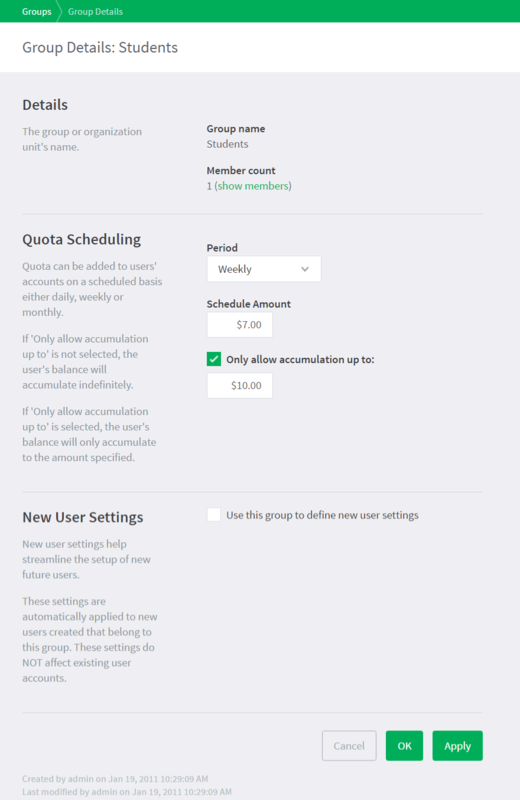 It is also possible to specify a maximum limit on quota allocations to prevent users from "banking up" their quota. A currency model leads to less waste, because users naturally choose the cheapest way to print. Currency is familiar, so easy to understand. People understand that different items have different costs. Currency is flexible. Costs can be assigned based on the cost to run a particular printer, and can be changed and tweaked at any time. If you don't like the idea of using currency (perhaps because it implies charging or real money) then it is possible to remove the currency symbol and work in "units" instead.